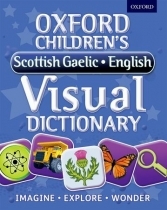 With thousands of words from a variety of topics, the new Oxford Children's Scottish-Gaelic-English Visual Dictionary gives students learning, and using, Scottish-Gaelic the best reading and writing support. It contains a range of topics grouped under main headings such as People and Homes, Food and Clothing, School and Work, Sport and Leisure, Art, Music, and Entertainment, Transport, Animals and Plants, Planet Earth and the Environment, and Space. Each topic includes a short introductory text given in both Scottish-Gaelic and English plus over 20 bright, modern illustrations labelled in both Scottish-Gaelic, using Standard Written Form (SWF) and English. The illustrations feature engaging children characters and the topics are familiar and appropriate to the primary curriculum. 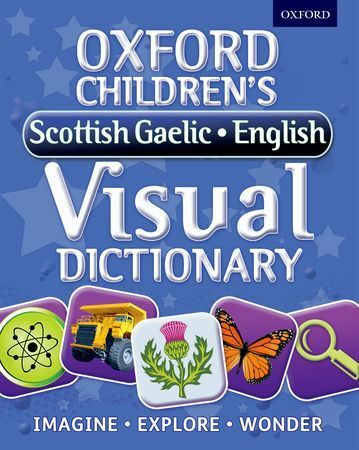 Introductions to the language and how to get the most out of the dictionary, along with pages on opposites, numbers, time, and calendar words plus full indexes in both Scottish-Gaelic and English.